Fractional laser skin resurfacing (ablative and non-ablative) appears to achieve skin improvements that can get close to conventional ablative laser skin resurfacing but with fewer potential side effects. Examples of branded devices include Fraxel and Pixel, but there are many others. The process of directing a light source to target a selected area of the skin to damage it is technically known as "selective photothermolysis"; where “thermolysis” refers to ‘decomposition by heat’ and “photo” refers to ‘light’. 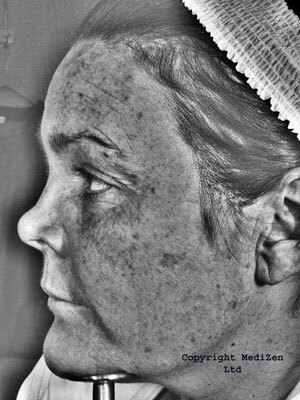 Unlike with selective photothermolysis, where the whole of the selected target area is damaged; “Fractional Photothermolysis” seeks to only damage certain zones, (producing tiny dot-like treated areas on the skin), leaving the other zones within it perfectly intact; hence only causing fractional damage. This allows the skin to heal much faster than if the whole area was treated. The costs for fractional laser skin resurfacing depend on the area(s) being treated and the type of device being used plus any additional single patient disposable items required by some systems. The Fraxel™ SR machine was launched in the USA at the end of 2004. The current Fraxel range includes three fractional lasers - two for non-ablative treatments and one for ablative treatment; Fraxel Re:fine™, Re:store™ (also available as Re:store Dual) and Re:pair™. The Pixel 2940 laser device uses fractional ablative technology aimed at rejuvenating aged and sun damaged skin with less downtime than is associated with traditional ablative laser skin resurfacing. The use of light from lasers for medical procedures was developed in the 1960s when they were first used as cutting tools in operations by some surgeons. Laser technology has developed over the last few decades to treat patients with a variety of different skin problems including the effects of sun damage, the removal of body hair and recently the treatment of psoriasis and acne. Since the early 1990s, lasers have become the high tech equivalent of dermabrasion or deep chemical peels for skin resurfacing (removal of the outer layer of the skin). Laser skin resurfacing declined in popularity due to the development of less aggressive light treatments aimed at skin rejuvenation. Figures from the American Society for Aesthetic Plastic Surgery (ASAPS), which started to track statistics for fractional laser skin resurfacing treatments, specifically with the Fraxel™ device from 2007, have now broadened the data gathered to various ablative and non-ablative fractional laser devices. For example, data indicates that in 2017, 59 764 micro-ablative treatments were performed, an increase of 99.5% on the number of procedures in 2016. Micro-ablative resurfacing (fractional resurfacing) is now the ninth most popular nonsurgical procedure in the USA. If you are considering fractional laser skin resurfacing the following information will give you a basic understanding of the procedure. It can't answer all your questions, since a lot depends on the individual patient and the practitioner. Please ask a practitioner about anything you don't understand. What are Ablative and Non-Ablative Lasers and how do they work? The process of directing a light source to target a selected area of the skin to damage it is technically known as "selective photothermolysis"; where “thermolysis” refers to ‘decomposition by heat’ and “photo” refers to ‘light’. So - called "ablative" or skin resurfacing lasers briefly direct an intense burst of laser energy onto the surface of the skin. This energy heats water within the surface layers of the skin, causing both the water and the tissue of the skin to turn to vapour. Every time the laser passes over the skin, some of the outermost layers of the skin are removed in a precise and controlled way to the appropriate depth. This intensive treatment can significantly reduce the appearance of lines, wrinkles, and pigment (or skin colour) changes on the face, neck, and other parts of the body. They can be used in sensitive areas, such as lines around the lips, eyes and even eyelids, or over the whole of the face. Acne and other types of scars and certain stretch marks can also be improved. It is thought that the laser's heat in the dermal layers causes collagen to be produced which helps reduce the appearance of lines and wrinkles. However, the results from this type of procedure are less obvious than those which can be achieved with ablative laser skin resurfacing during which the surface of the skin is removed. The use of different types of lasers by cosmetic clinics has increased significantly in recent years. The new non-ablative laser machines are aimed at giving maximum treatment results with minimum recovery time after the treatment. More recent still is the arrival of other non-ablative light machines, such as Intense Pulsed Light (IPL), Light Heat Energy (LHE) and Light Emitting Diode (LED) systems that can be more flexible in their use than some other lasers. Unlike with selective photothermolysis, where the whole of the selected target area is damaged; “Fractional Photothermolysis” seeks to only damage certain zones within the selected target area, (producing tiny dot, or pixel-like treated areas on the skin), leaving the other zones within it perfectly intact; hence only causing fractional damage through the heat of the light source. This allows the skin to heal much faster than if the whole area was treated, as the ‘healthy’ untreated tissue surrounding the treated zones helps to fill in the damaged area with new cells. Fractional Photothermolysis or Fractional Laser Skin Resurfacing can therefore be compared to the precise alteration of digital photographs that we are able to do nowadays; pixel by pixel. The concept of this fractional laser technology can be applied with either ablative laser resurfacing or non-ablative laser skin rejuvenation, using the various different wavelengths of lasers available. The efficacy and safety of the different types of laser technologies is illustrated in the chart (right); (Source: Aesthetic Buyers Guides, March/April 2007). This fractional approach (ablative and non-ablative) claims to achieve comparable skin improvements as obtained with conventional ablative laser resurfacing with an Er:YAG or CO2 laser, (depending on depth and severity of wrinkles), but without the associated side effects or downtime; i.e. you get the results of an ablative laser but with the downtime of a non-ablative laser. Optimal improvement after fractional treatment is usually visible in about 2 - 3 months as collagen remodelling and skin tightening continues. The longevity of results is comparable to ablative laser resurfacing and as always is dependent on future ageing, the effects of gravity and sun exposure. Initially, when this technology was first introduced in 2003 there was only one device in the UK and US marketplace for fractional photothermolysis, the Fraxel™ SR laser machine by Reliant Technologies Inc (now part of Solta Medical). It subsequently became the first fractional device to be cleared by the US FDA for a variety of other indications, such as the correction of wrinkles around the eyes (2004), skin resurfacing (2005) and the treatment of melasma (2005), pigmented lesions, e.g., freckles, age spots etc. (2004) and acne scarring (2006). Although the Fraxel™ devices are still used, other manufacturers are rapidly expanding their product ranges in this niche area to meet the growing demand. The original Fraxel™ laser machine fired a 1550nm diode pumped erbium fibre laser beam which is then split into thousands of microscopic beams, producing tiny dot, or pixel-like treatment zones on the skin; referred to by the manufacturer as MicroThermal Zones (MTZs). At 1,500 – 2,500 MTZs per cm2 (depending on machine settings), the MTZs are invisible to the naked eye, other than as an overall “bronzed” look they give to the skin. Each MTZ is about 30 - 70 microns in diameter, (a micron is one millionth of a metre), and 400 - 700 microns deep. This is in contrast with the typical depth of 200 - 400 microns achieved with ablative resurfacing; where any deeper and you risk scarring. The Fraxel™ laser treats between 12 - 20% of the skin with each treatment session. As with ablative lasers, the Fraxel™ is also attracted and absorbed by water in the tissues; however in this case the stratum corneum, (the outermost layer of the skin, consisting of dead cells that slough off) is more or less spared from damage by its low water content, meaning it has a low absorption of laser energy. The manufacturer, Solta Medical have since replaced their original Fraxel® SR Laser with a range of devices including the Fraxel re:fine, re:store (and re:store dual) and the re:pair. Launched in the US in April 2006, the FDA approved Pixel® 2940 from Alma Lasers (distributed in the UK by Advanced Beauty Cosmetics Ltd) is a 2940nm Er:YAG ablative laser delivered to the skin through a micro optics lens which creates 49 (7x7) or 81 (9x9) pixel sized ablation dots on the skin within an 11mm x 11mm treatment zone. Alma Lasers market the Pixel® 2940 as ‘combining the proven effectiveness of an ablative approach with the patient comfort level and convenience of a non-ablative approach’. Unlike traditional ablative lasers, used only on the face, the Pixel® 2940 is targeted at treatments on the face, neck, chest, arms and hands, giving it a wider scope for treating aged and sun damaged skin. The Lux 1540™ Fractional device from Palomar (distributed in the UK by Eden Aesthetics) is a 1540nm erbium glass fibre non-ablative laser, which is delivered to the skin in tiny microbeams, in combination with contact cooling of the skin’s surface. The Lux 1540™ can penetrate up to a depth of 1mm into the skin, whilst also leaving the skin’s surface intact, creating tiny columns of treated (or coagulated) tissue which are surrounded by the healthy tissue. With a choice of treatment size heads for skin resurfacing and wrinkle reduction, the Lux 1540™ can produce 100 microbeams/cm2 columns for deep coagulation (up to 1mm) with a 10mm head, or 320 microbeams/cm2 narrower columns for relatively shallow coagulation, with the 15mm head. It was approved by the FDA in February 2007 for ‘skin resurfacing procedures and dermatological procedures requiring the coagulation of soft tissue’. Affirm™ from Cynosure – This is a 1440nm Nd:Yag non-ablative laser with Cynosure’s proprietary Combined Apex PulseSM (CAP) technology. This is a special lens mounted over the end of the laser that consists of approximately 1,000 diffractive elements per cm2 which put simply ‘bends’ the wavelength of light emitted from the laser so as to affect more surface area per single pulse of the laser. The Affirm™ targets the superficial layers of sun damaged skin, and delivers both a high and low energy of light within the treatment zone, due to the lens configuration, which they claim enhances collagen remodelling whilst also stimulating collagen production. Active FX from Lumenis – This is based on the company’s existing UltraPulse Encore technology, which underwent computerised modifications, and now comprises a single treatment system for ablative fractional photothermolysis with a CO2 laser. Active FX is the most aggressive of the fractional laser devices introduced to the market so far. As such treatment with this device requires a topical anaesthetic and produces the most lengthy down time for this type of procedure. Profractional from Sciton - This 2940nm fractional ablative laser device was launched in the US in April 2006 and in the UK in April 2007, (distributed by Sigmacon Ltd). The manufacturers claim that it differs from other fractional devices because of the method of delivery of the laser energy, which it says makes for a more comfortable treatment experience by reducing any unnecessary heat build-up. With a treatment head of 20mm x 20 mm, the Profractional can produce a variety of pattern configurations (dots) on the skin depending on the condition and area being treated. These dots can penetrate from 25 to 1500 microns in depth, depending in the settings used. The Profractional can treat from 1.5% – 60% of the skin within a treatment zone. 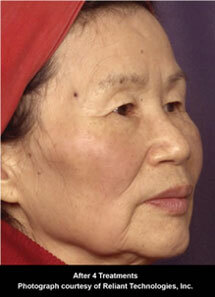 What can Fractional Photothermolysis treat? Fractional photothermolysis is used for the treatment known as skin rejuvenation/resurfacing, which includes; the reduction and possible removal of fine lines and wrinkles, improvement of deeper wrinkles, repair of sun damaged skin on the face, neck, shoulders and hands, the reduction of age spots and blemishes, acne scars and hyperpigmentation (areas of darker pigment or brown patches in the skin). The Fraxel™ re:store laser, for example, has been awarded clearance by the American Food and Drug Administration (FDA) for dermatological procedures requiring soft tissue coagulation; for the correction of peri-orbital wrinkles (crow’s feet), acne scarring and pigmented lesions, including age spots, sun spots and skin discolouration; for skin resurfacing and for the treatment of melasma, (dark skin colouration which forms on sun exposed skin – often affects women during pregnancy). What happens during a Fractional Laser Skin Resurfacing treatment? The way that the procedure is performed and the preparations involved will depend on the specific device that the practitioner is using. The type of device used will have a bearing on the need for contact gels, cooling systems, topical anaesthetics etc. As an illustration we will describe the process involved with treatment using the Fraxel™ laser. The skin is first cleansed and a topical local anaesthesia may also be applied to increase patient comfort during the procedure, the handpiece also has a built in cooling mechanism. The laser treatment head is then passed over the surface of the treatment area in a series of horizontal and vertical overlapping passes, until an erythema or mild redness is noted in the skin by the practitioner. The anaesthetic are washed off immediately after treatment. A typical treatment of the face will take approximately 20-25 minutes. Unlike with ablative laser resurfacing, where one treatment is usually enough; multiple treatment sessions are often required with fractional resurfacing to obtain optimal results, although as the machines have developed over the years many are now claiming a single treatment session only. How long will it take to recover from Fractional Laser Skin Resurfacing? Depending on the device used, area treated, and how aggressive the treatment session is – recovery time can range from a day to up to a week. What are the risks and potential complications from Fractional Laser Skin Resurfacing treatment? Fractional photothermolysis or laser skin resurfacing offers speedy healing and minimal to no downtime. Depending on the area of your body treated and the type of device used, the procedure is said to be well tolerated; feeling like a mild prickling or burning sensation, or like elastic bands flicking on the skin. However, your practitioner may apply a topical anaesthetic to your skin prior to treatment to reduce any pain and discomfort, and offer you a chilled air device to hold over the treatment area yourself. For several hours afterwards the skin will feel tight and have the appearance of a “sunburned” look. The skin will continue to look “pinkish” for 2 - 7 days (depending on the device used) and any swelling, which should be minimal, usually disappears after 1 – 3 days. With Fraxel™, a bronzed, sun tan look caused by the dead, burnt cells at each MTZ will then remain for 3 – 14 days before naturally exfoliating. Generally, as the skin heals itself, you will find mild to moderate skin flaking, which may last for up to 2 weeks. Side effects or risks are minimal with this type of treatment and typically involve swelling and redness. There is a very limited risk of infection or scarring, with no oozing or crusting of the skin having occurred according to the manufacturers. Compared to laser resurfacing, there appears to be a reduced risk of hyper- or hypo- pigmentation (areas of darker or lighter skin colour) with fractional photothermolysis. This is thought to be due to the fact that areas of healthy tissue are kept intact between the treated areas, unlike with ablative lasers, meaning that lasting pigment change does not occur. What should you do after a Fractional Laser Skin Resurfacing treatment? It is very important that you follow the advice of your practitioner carefully after any light treatment to help make the procedure as successful as possible and to reduce the risk of complications. Women can camouflage skin redness with make-up straight away if desired. Apply a hypoallergenic moisturiser which can help mask any bronzing and skin flaking symptoms. Avoid creams with active ingredients such as AHAs or Retinoids which irritate the skin and could impede the healing process. Do not sleep on the treated area, to help avoid any swelling; e.g., sleep on your back rather than your side if your face has been treated. Cool compresses (not ice packs) or cooling gels such as aloe vera can be applied to the treated area if required. Avoid sun exposure during treatment and healing phases and/or wear sunscreens with an SPF of 30+ which contain zinc oxide. Depending on the type of fractional laser device used there may be issues of safety for people with some darker skin types, particularly Fitzpatrick skin types IV, V and VI; Hispanic, Latin, Asian, Indian, Middle Eastern and both lighter and darker toned black skin. Always seek advice about your skin type from an experienced laser professional. Who can perform Fractional Laser Skin Resurfacing? Generally a suitably trained and experienced doctor or nurse should perform all treatments that involve skin resurfacing using light sources. What is the average cost of Fractional Laser Skin Resurfacing? Private costs for fractional laser skin resurfacing treatments depend on the area(s) being treated and the type of device being used, as this will impact on the need for additional single patient disposable items such as gels, dyes and treatment tips which will incur extra costs. 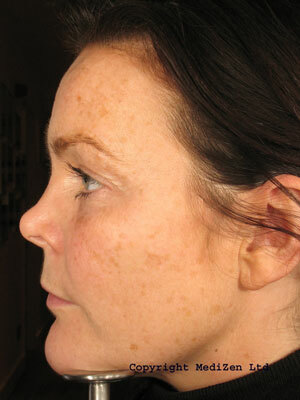 For example, a Fraxel™ treatment session can range from approximately £450 - £600 for one small area of the face (e.g. forehead, cheek) or neck to £950 for a full face or décolletage (the area between the neck and breasts) treatment to up to £1,500+ for full face, neck and chest areas. A Pixel® 2940 treatment session can start from approximately £300 for a full face treatment. Traditional ablative laser resurfacing has been shown to be very effective in improving deeper lines and wrinkles associated with sun damaged skin. The downside is the recovery time and potential complications. As a consequence of this, the development of lasers has focussed on non-ablative laser and IPL light sources that do not remove the surface of the skin, but still cause visible improvement of lines and wrinkles. These alternatives do not, as yet, produce such dramatic and long lasting results as ablative lasers, but they are safer and involve virtually no recovery time. 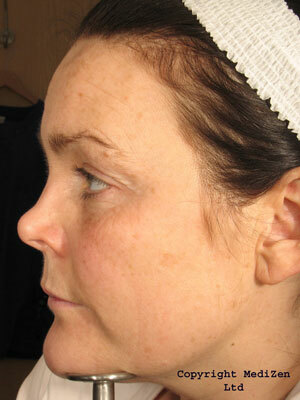 Please see our laser/IPL/LHE skin rejuvenation section for more details. 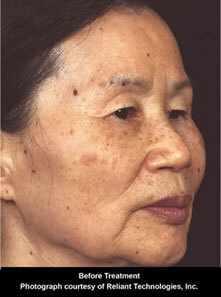 The fractional laser arena can also be divided into fractional ablative and fractional non-ablative devices. 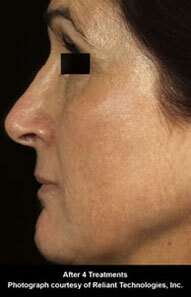 Whilst not 100% as effective as traditional ablative laser procedures, (depending on the depth and severity of the wrinkles being treated), fractional laser skin resurfacing (ablative and non-ablative) appears to achieve comparable skin improvements as obtained with conventional ablative laser skin resurfacing but with fewer potential side effects. 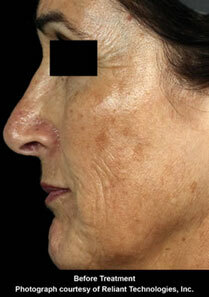 Before and after images of treatment using the Fraxel™ SR Laser. 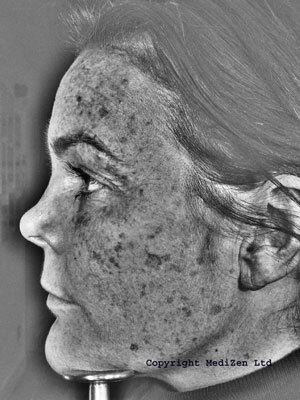 Images courtesy of Reliant Technologies, Inc.
Left pictures: Mottled pigmentation cause by sun damage (black and white picture is taken using a UV camera). Click for ALL Fractional Laser Skin Resurfacing clinics in the UK & Ireland registered and verified by Consulting Room.